Hi everyone, back from a lovely, relaxing holiday on the beautiful Greek Island of Thassos. The kitties survived their first holiday in the Cattery too but seem very pleased to be back home. They seem to have grown quite a lot in 2 weeks but refuse to sit still long enough for me to take a photo !! I see I have quite a few new followers since I've been away so welcome to you all and thanks for all your comments. This week's freebie is something I made to add as an embellishment on children's cards or perhaps add to wrapped presents. I have made them fairly small but they will easily resize if you need them bigger- hope you find them useful. I am glad that you came to my country, Shirley. Greece is beautiful and Thassos is a lovely island. Thank you for sharing this birthday decor. Kisses, my friend. Thank you Shirley, love your work. Thank you so much Shirley. Hope you had a great holiday and the kitties enjoyed their break at the cattery. Thank you for the lovely toppers. Love what you do.... so talented! thanks for the files Shirley. they will be useful. Merci beaucoup Shirley. Heureuse que vous ayez passé de bonnes vacances en Grèce. Je suis certaine que les chatons soient également heureux de leur retour à la maison. It is sweet, and so are you. Merci beaucoup pour ce cadeau . I'm sure this would be a well used cut file Shirley. Thank you. SO glad to hear you and the pusses had a Great time. Thanks for a file that will get use quite often! :) So glad you had time to relax and that your kitties are happy to be home. Thank you for the cute birthday toppers. One can never have enough of birthday things. 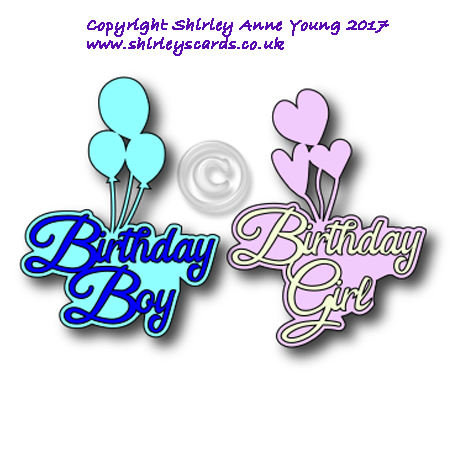 These sweet birthday toppers are such a nice idea. You are special to share with us! Thank you very much. Glad you enjoyed your holiday, and thank you for these cute files. Thank you Shirley! I hope to use this card as I seem to be using your templates lately and have another one from a previous template. Your files cut beautifully and I appreciate them so much! Glad you had a wonderful vacation. Glad to see you enjoyed your vacation. Thanks for sharing these cute card toppers. Thank you for sharing lovely card. I love your patterns you create. thankyou so much for your cards I think they are great, thanks so much. This will accent my grandchildren's cards this year, thank you so much! Thanks Shirley, just come across your blog and this is the very first time I have downloaded an SVG file so wish me luck! Thank you.These will be very handy and so nice.